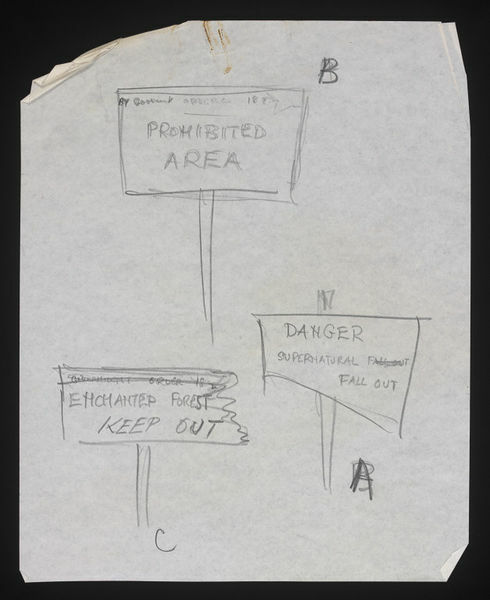 Preliminary sketch design of signs to be used in 'The vicinity of a dense forest' in pantomime The Sleeping Beauty, London Palladium, 1958. 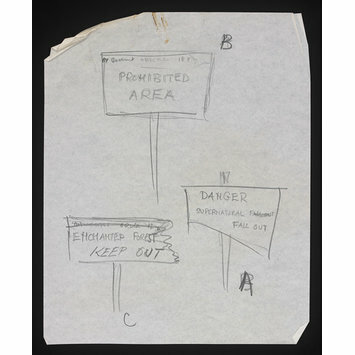 Pencil on paper preliminary sketch design of signs to be used in 'The vicinity of a dense forrest' in pantomime The Sleeping Beauty, London Palladium, 1958. The design features 3 different signs. The top sign reads 'Prohibited Aread'. The sign on the left reads, 'Enchanted Forest: KEEP OUT'. The sign on the right reads, 'DANGER: Supernatural fall out'.